Previous Prev Uganda's Proposed "Gay Death Panels"
2009 wasn’t the best year for me health wise, as illustrated by my multi-part series about World AIDS Week in December a few weeks ago. Since then, I’ve figured that I spent at least 1/6 of the year at less than 100%, due to two coughing episodes that lasted a combined 8 weeks. So, I guess after the year I had, it was only appropriate to end 2009 with a stay in the hospital. 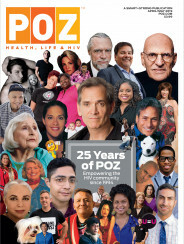 The reason why it took me so long to blog about the World AIDS Week stuff is because part of my survival strategy in living with HIV for over two decades has been to deal with what comes up, then move on and not dwell on the fact that I’m not the perfect picture of health. In the pre-med days, a positive attitude and good friends/family were the only thing I had to fight with. So, if you find it odd that I’ve been blogging about other things since my Christmas Eve Eve Eve spent in the hospital, that’s probably why. Plus, the following story wasn’t exactly in line with the festive mood one associates with the holidays. Now, safely removed from the tinsel and egg nog hangovers, you can gather your family around ye ol’ laptop for Shawn’s Holidaze Craptacular. Image from my Decker’s Daily Coffee site on Flickr. The weekend before Christmas, a massive snowstorm hit the East Coast. Over two feet of snow dropped on my hometown. Though my cough had returned, I had sufficient snow-wear and went sledding for the first time in over a decade with friends, who were snowed-in in the neighborhood with us. I even took a beer onto the street, since there would be no cops or cars or anything to interfere. After the month I’d had, it was a good time and I was happy to let loose and enjoy Mother Nature’s furious case of dandruff. A couple of days before the snow hit, I woke up with a sore throat that I suspected was a bacterial infection, so I went to an outpatient care center and where I doctor looked at my throat, agreed, and prescribed me some antibiotics. After two nights of sledding, the sore throat was gone but my cough had returned. It was really irritating, especially on Monday, the day my friends were finally able to commandeer their cars home on the still-snowy and slick roads. By night, the cough was being soothed by glass after glass of water, but my frustration grew when my nose started to bleed. A pesky little bleed, but after a month of them I was worn out. I took Stimate, a nasal spray that boosts my clotting factor, and the bleed stopped. At night all I wanted to do was sleep, but my mind was racing, worried that the cough would keep me up. Frantically, I found a spot, curled up, then made ridiculous requests of Gwenn, like a straw that I could slurp from on my side, so I didn’t have to sit up to drink, afraid that this would make me cough. I didn’t realize it at the time, but I was completely manic. At around 7:30 am I woke up after an hour of sleep. My heart was racing. I told Gwenn we had to go to the hospital or call 911. I honestly felt my life was in danger, and was having a panic attack. See, I don’t really panic, I’m a pretty chill guy and credit that to having been warped by some serious medical traumas early in life. Plus, I have a healthy sense of spirituality that helped me loosen my grip on this physical realm before I got my learner’s permit. So panicking in and of itself caused me to panic more. “No, no, driving is faster, let’s get to the car,” I said. Gwenn was terrified, but used her upbringing in Cleveland to drive me safely to the hospital. Along the way, however, I had her stop the car so I could get out and throw up as cars drove slowly around around us. “Don’t get hit!” Gwenn begged. When I hurled, it was so violent that my nose started to drip blood on the white snow. “Fuuuuudge,” I thought, not thinking that particular word. With a shaky hand that had nothing to do with the temperature outside, I picked up a huge chunk of snow that was roughly the size of my face, held it to my nose and got in the car. The rest of the drive I felt much calmer, and knew I wouldn’t die. When I checked the snow for blood, I was relieved that the nose was under control, but kept it to my face because it was soothing. Small victories, but a tiny step forward from fearing for my life. Once inside the ER, I was taken to a waiting room, and given IV fluids since the basics of what was going on were a) I have AIDS and b) I’d thrown up on the way to the hospital. The night before I’d drank so much water; only after they ran labs did they find out what had happened. The Stimate nasal spray can cause fluid retention. All the water I drank to keep my throat soothed from the cough had caused my electrolytes to crash. The IV fluids administered didn’t help, either. By the time I had a room, I couldn’t even gather the energy to talk, and each time a doctor came in and asked (lots, UVa is a teaching hospital) I nodded to Gwenn, who explained everything since I was too exhausted to put together a coherent sentence. Every two hours they drew blood. My HIV blood levels were normal, my hemophilia clotting levels were normal (which is why the nosebleed in the middle of the street stopped so fast), but my Sodium level was 121. The normal range is anywhere from 136-142. If your sodium drops to 119, you are at risk of falling into a coma. They put me on a fluid restriction, which upset my stomach and made it hard to eat without feeling nauseous. Around 10 pm, there was still concern that I may have the flu, the plus side of that concern was that I was moved to my own room which was much quieter. Before we were “quarantined”, Gwenn stepped out of the room to make a phone call or grab some crackers, and I was visited by a doctor wearing a face mask in a wheel chair. He had an accent that I couldn’t place- it sounded Romanian, almost Dracula-ish. If he were a vampire in disguise, he came to the wrong fudging room. As the doc explained his thoughts on what had happened to me and that the culprit was the hemophilia medication, I was still feeling completely high, but was finally able to have the wherewithal to say, “Yeah”, “Uh huh”, and all the other phrases we use as humans to get through our day. I wished that Gwenn had been there to witness the eerie visit (I couldn’t get the first Saw movie out of my mind for some reason), and I knew I was getting better. I also thought about my poor luck with hemophilia medications over the course of my life- hepatitis B, HIV, hepatitis C and now this assassination attempt. The doctor in the wheelchair gave me his prognosis, that I’d be okay and everything should naturally bounce back with the fluid restriction. After a few naps in my private room, I woke up to the request of another nurse with another needle requesting to poke another hole in my arm. I invited Gwenn to my bed for a cuddle around 2 AM, and it was the first time since arriving at the hospital 18 hours earlier that I felt like being touched by anyone. By the morning, my Sodium level rose modestly to 123. The doctor in the wheelchair came to visit again, without the face mask this time. He said he was comfortable letting me go home just after noon, so long as I came back to the hospital the next day- Christmas Eve- (and then 3 days later) to get lab work. By this time, of course, my Christmas plans to spend Christmas Eve at my brother’s an hour away had already been canceled, but I was more than happy with how the year was ending and that I’d be going home for some much-needed rest. Before being released, my Mom stopped by for a visit and brought a big bag of presents. The next day my parents came by our house to drop off more presents on Christmas Eve. But the best present came when I got the results from my labwork- my sodium level had risen to 137- perfectly normal! Which meant my body had bounced back, and the one-bottle-of-water a day restriction was lifted. They thought it would take a week for the levels to stabilize, and I was really concerned about feeling sick to my stomach for that long. Not to be greedy, but I wanted one more thing for Christmas; a good night’s sleep. After getting home from the hospital on Christmas Eve Eve, I had trouble sleeping, and was awake from the time I got home until after my parents came by the next day; it was crazy. Especially since I rest pretty easily. It was like my mind was still in knots. But, on Christmas Eve night, with no liquid restriction, I took a modest amount of Nyquil and that did the trick. The next morning, I was still too shell-shocked to leave town, but had enough energy to go by our friend Lauren’s (the one who I shot the music video for) and see our Goddaughter, Evie. Then it was back home for another great night of sleep. Though I didn’t really get into the Christmas spirit this year, I was more thankful than ever (no joke- I’m always deeply thankful) for everything I have, especially after it was threatened. I learned that I need to stay on top of all of my medical conditions and, just as importantly, the medications I put into my body. I’d been warned about the water retention with Stimate about four years ago, but had never taken it consistently as I did over the last 5 weeks of 2009. Even though the clusterfunk was scary, I survived the year, joking with Gwenn that I end decades like a drama queen, reminding her about our first year together in 1999, the year that my t-cells crashed and I had to start on HIV meds. I’ve always liked to think that my specialty is outwitting the Reaper and all of his sneaky tools of destruction, and I don’t want to come that close to meeting the blade any time soon. If I’m fortunate enough to avoid disaster until 2019, you know I’m going to be ready for whatever comes my way and, just to be safe, I’m going to go over my prescription bottles with a fine-toothed comb on Christmas 2018. With Gwenn I am in safe hands, but truth be told, this happened because I let me guard down. That Monday night I ignored some pretty significant warning signs from my body, and before that I told myself that coughing for a month was acceptable merely because I am a positoid. I should have reached out to my hematologist or my infectious disease doctor. Now, on the plus side, I have a primary care physician as a result of the hospital stay- she rocks, and in the future instead of seeing a “stranger” with a prescription pad at an outpatient facility I’ll contact her, and she can see me any run things by the other doctors. There is a way to keep the attitude that helped me survive those early years, while expanding my odds of continuing this mortal journey by asking for help when my body is screaming for it.